Today Timing, the app that automatically tracks your time on the Mac got a nice update. The headline new feature is calendar integration. If you block schedule time, like me, this is really helpful since it shows all of your time across the bottom of the Timing data, making it even easier to categorize and make adjustments. There’s more, like weekend mode, that you can learn about from the developer. This week MacSparky is sponsored by WinterFest 2018. WinterFest is the year and software sale by some of the best software available for the Mac. A powerful application to help you visualize and organize ideas. One of the most impressive word processors for the Mac. 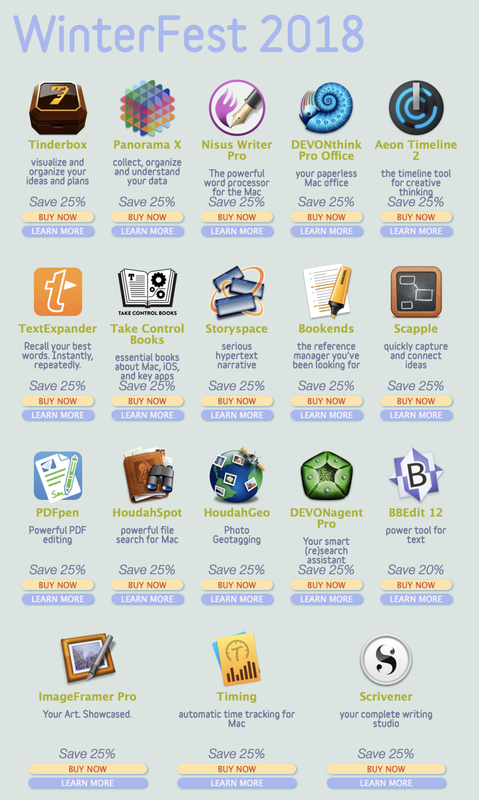 I know a lot of people that use this application to manage research and all of their paperless files. Whether you're writing code or a novel, this is one of the most powerful text editors available. The utility I use every day to save me so much time. 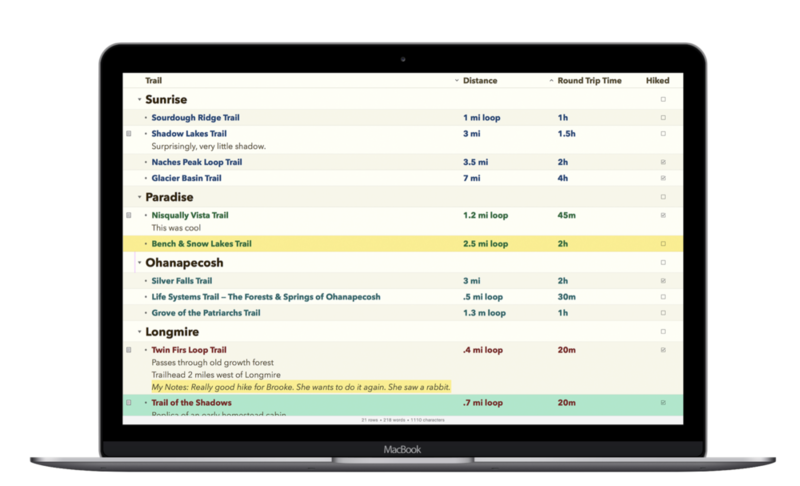 The best tool to automatically track all of your time on your Mac. Long form writing, done right. These are just a few of the applications available through WinterFest. This is limited time pricing so get in there and upgrade your Mac Software today. After something that felt a lot like a hiatus, Launch Center Pro came roaring back into the iOS automation space this week. You may recall Launch Center Pro as one of the original iOS automation tools. The idea behind Launch Center Pro, which hasn't changed since its initial launch, is to give you an app to launch other applications and other automation friendly tasks with just a few taps. 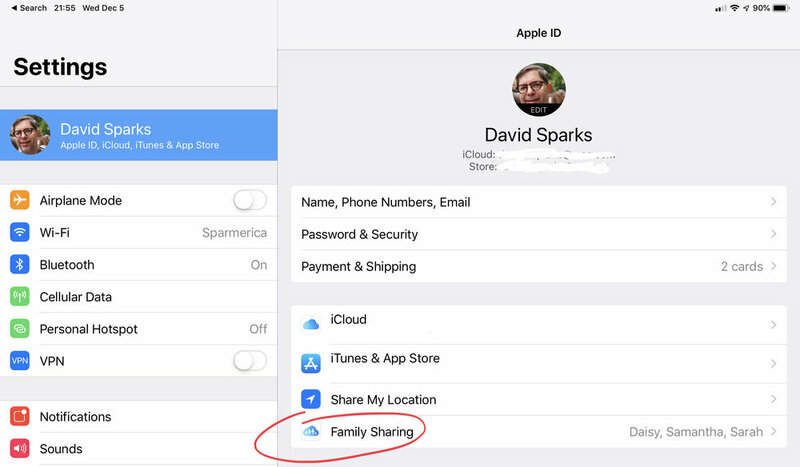 Open the app and you can immediately initiate a telephone call to your spouse or prepare an email to those key people at work or do any other type of URL scheme-based iOS automation (which these days means quite a lot). With version 3 you can also launch Siri Shortcuts and other automation tools making the app even more useful. Not only does this new version expand the dictionary of available automation actions, but it also lets you trigger automation with things other than a tap in the application. These include NFC and time-based triggers. NFC Triggers are little NFC stickers you can purchase from the developer. Once you program them (it's easy), putting your phone in the proximity of the sticker is enough to trigger the automation. (This only works with iPhone X or later iPhones). As an example, I have a phone stand on my writing desk. I've been trying to get better at journaling so now when I set my phone into that stand, it scans the NFC sticker and runs a simple Siri Shortcut to open and create a new entry in Day One. I put another sticker next to the shelf where I put my workout shoes. When I tap it with my phone, it sets an exercise timer and kicks off a podcast on my phone. People are using these stickers at their desks, in their cars, and anywhere else they want to make automation easier. There are also significant improvements to the ability to have scheduled automation, something we don't currently get with Siri Shortcuts. I have been using this new version of Launch Center Pro throughout the beta. It's stable and it's much faster than version 2. While Launch Center Pro isn't more powerful than Siri automation, it still has a place. It's wicked fast not only in launching your URL-based automation but also Siri Shortcuts themselves. Moreover, the addition of NFC and time-based automation gives you some pretty cool automation triggers that don't exist otherwise on iOS. There are a variety of ways to support the app from subscription to a la carte feature purchases. We've got David Barnard, Launch Center Pro's developer coming on Automators later this week to talk about how the app fits in the world of Siri Shortcuts. I expect with the new app and the new business model, we'll see more great things from Launch Center Pro in the future. What Happened to the iPad Split Keyboard? Today Stephen Hackett wrote about that clever feature that started in iOS 5 and let you split and move the keyboard on your iPad. For some strange reason, however, this feature never made it to the 11 and 12.9 inch iPads Pro. This seems particularly silly to me with respect to the 12.9 iPad Pro, where typing in portrait view is very awkward unless you have hands big enough to palm a basketball. I actually had this on my list of gripes for this week’s iOS tips Mac Power Users episode but I never got around to it. I’d love to know why this feature got pulled from the most expensive iPads. There's a lot hidden in iOS. Katie and I run down some of our favorite iOS tips and tricks that you may not have known or have forgotten about on this week’s episode of Mac Power Users. Fujitsu ScanSnap: ScanSnap helps you live a more productive, efficient, paperless life. This week’s home screen features Elia Freedman (website)(Twitter), the developer of the PowerOne calculators, one of my favorite calculators, particularly for business and special purpose functions. Elia’s been paying for his shoes with mobile apps much longer than the iPhone has been around and has some definite opinions on how he uses his iPhone. So Elia, show us your home screen. I love productivity software! (Surprise given that if I'm known for anything I'm known for writing a calculator for the past 22 years!) In particular, I love GoodNotes. I prefer handwriting lots of stuff, to be honest, and GoodNotes lets me take notes, draw screen designs for my software, and all kinds of other stuff all in one app. I spend a lot of time in my own app, PowerOne calculator, Dropbox, Google Drive, and Reeder for RSS feeds as well. For work I spend a lot of time in Slack and Asana. Asana, for tasks, is as close to my own mental model for how to do task lists. We use it for tracking bugs, feature requests, and what we are currently working on. I'm also learning to play guitar and have a number of apps for that as well. I use GoodNotes to transpose tab notation on various songs, my teacher actually draws on a whiteboard and I take pictures of all the lessons, and I use apps for tuning my guitar (GuitarTuna), apps for slowing down songs (Capo), and an app that has tons of tabs for songs (GuitarTabs). Finally, during baseball season, you'd find me in MLB app quite a bit. I read baseball and Cleveland Indians news, and love watching and listening to games. I love to read and spent a lot of time in Reeder and Safari. I love Safari's reading mode. When I will be without an internet connection I use Instapaper to read offline. I read the Washington Post on my iPad, the sports section of my hometown Cleveland Plain Dealer, my local newspaper, The Oregonian, and Twitter as well. I also really enjoy the National Geographic app on my iPad. The experience of the app impacts whether I will continue reading the source. While the Plain Dealer and Oregonian have horrible apps or no app at all, the website is passable. I'm thankful for how good Safari is! What app do you know you're underutilizing? Not an app per say but the iPad in general. Because I write code I spend a lot of time on a big screen. (27" first gen iMac 5k) I really wish I could spend more time on my iPad however. For apps I'd really like to spend more time in Photos. Its ability to edit pictures, organize them, and share them is so powerful and yet all I use it for is as a massive dumping ground for family photos. Programming stuff, although I don't know how reasonable it is to write code on the small screen. For that, I'd need Xcode for iOS, Terminal, Github, and database clients, plus some way to run Ruby on Rails. Then it would still be writing code on a small screen. It'd be pretty cool to "dock" my iPad, though, to a 27" screen and get the benefits of both. This dream dates back to the late-90s/early-2000s when I got my first Windows 2000 tablet. I use it off and on all day on my iPad, especially when traveling or away from my desk. I generally don't write code away from desk so only carry the iPad when traveling. While there are some inconveniences, for the most part I can do everything I want on it. I use it to read during breakfast and lunch, if I'm home, and read a lot in the evenings especially after the kids go to bed. It sits on my desk next to me during the day and use it as a second screen for all kinds of work stuff. And my Pencil is never far away. I'd have to say the Pencil, although I utilize split screen a lot as well to work on two things simultaneously. From a product perspective I'd focus more attention on making iPad a functional machine for all day work. I'd love to work on that problem myself! Yes! I use a minimalist Utility watch face. I like my watches fairly sparse but wish there was one more slot for a complement. I use my technology for four things: work (productivity), reading, communication, and exercise. My iMac and iPad is my primary tool for work and reading, my iPhone for communication, and my watch for exercise. The weather and exercise app are immediately available, the time and schedule ensure I have the time to get out and about. If I had one more complement I'd use it for my exercise rings. As of this writing I've completed my circles for over two months straight. What's your wallpaper and why? My iPad's wallpaper is a picture I took facing southwest from the rim of Crater Lake here in Oregon at sunset. My lock screen is a picture of my daughters. My general philosophy is to have all my apps about one folder away and never use a second screen. Ideally, the items on my dock act as an entry point into other data and/or apps I use in a smaller split screen regularly. And I hate seeing a full home page so always leave a few "app slots" open. Often times I use these for slots for apps I want to try. Oh... and if I had to pick either an iPhone or iPad, I'd pick iPad. I love this thing! This week Microsoft released an update to Office for Mac. The update makes Office for Mac dark mode-friendly. We’re just a few months since Apple released Mojave and Microsoft already has the new feature in Office. I have to give a hat tip to the Microsoft Office team. In years past, I was pretty hard on them. For years after the Mac Intel transition, Office was unusable. You would press a key and there was a noticeable delay before the letter would appear on the screen. It was like using an electric typewriter, except instead of electricity, the typewriter ran on a hamster power, and the hamster was drunk. I still have my quibbles (particularly on the feature set for the iPad version) but, overall, Microsoft Office is a solid set of applications across the Apple platforms. Now I just need to cross my fingers that when Apple starts shipping ARM-based Macs, Microsoft handles that transition better than they did the switch to Intel. If you’re a Setapp subscriber, the mind mapping application that I use nearly every day, MindNode, is now available. A few years ago I made some screencasts explaining how I use MindNode. It’s a great app to help you get started mind mapping. On this week’s episode of Free Agents, Mike and I do a year-end audit of our own free agency to figure out where we’ve spent our time and money. We talk about fixing broken systems, when to try something new, and make a big announcement about the future of the show. This week MacSparky is sponsored by OmniOutliner. This app is so much more than a just a beautiful outliner. It’s got automation, distraction-free mode, filters, slide-in sidebars, gorgeous styles, and more. Whenever I have a big client project in the law practice, I outline it in Omni-Outliner. I often share these outlines with clients so we can collaborate on getting things right. Recently I did this for a legal client on a complex transaction. Later, when I went to visit the client at her office, I found she had a blown up copy of my OmniOutline hanging on her wall that she was using a reference. I love that. To an extent, I view OmniOutliner’s gorgeous looking outlines as just one more thing that distinguishes me from others in my field. OmniOutliner is both pretty and powerful. Best of all, with their new Pro and Essentials versions it is priced so anyone can have the best outliner available for Mac, iPad, and iPhone. Head over to the Omni Group today and try it for yourself. 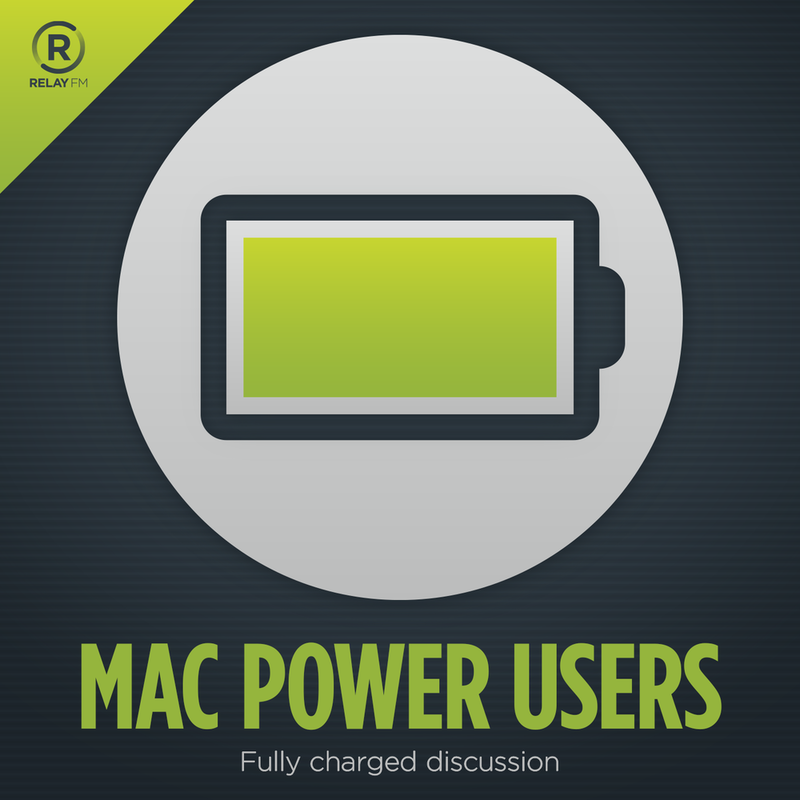 Casey Liss returns on this week’s episode of Mac Power Users to update us on his life as a free agent, his new love affair with the iPad, becoming a YouTuber, and more. Hover: Show the world what you’re passionate about with 10% off your first purchase. TextExpander from Smile: Type more with less effort! Expand short abbreviations into longer bits of text, even fill-ins, with TextExpander from Smile. There is a growing thread in the Mac Power Users forums about custom OmniFocus perspectives. Since it’s Sunday, I though I’d share one of my favorite Sunday perspectives. While I don’t use a defer-date management system for my tasks these days, I do use defer dates on flagged tasks. This perspective shows me all of those tasks on their defer dates going forward. It’s a great deal for a little weekly planning on Sunday. My pal Rosemary Orchard and Ryan Dotson released a new book, Build Your OmniFocus Workflow. I know Rose has put a lot of work into this book and it shows. I particularly like the coverage of advanced uses. It comes in PDF and ePub formats and the book, normally priced at $30, has an introductory price of $25. The holidays are upon us, and the Automators are ready to automate with episode 12, Holiday Automation. We start with simple things like wallpaper and voice-in-a-can technologies. Next, we get to holiday music. It’s great that you can automate music playback, but I want to go deeper with Siri Shortcuts and automation around my music. I have a white whale concerning HomePod destination for audio, but we all need holiday wishes … right? Rose has a cool holiday music Siri Shortcut. Then we get into our favorite automation contraptions for automating holiday lights. I have a thing for making Christmas just happen using HomeKit Automation, and Rose tempts me by talking about homebridge. Open my front door, and the magic starts happening. Then we get to the best ways to automate holiday cards. It’s harder than you think. Finally, we move into automating and collaborating on present lists, grabbing multiple browser tabs via automation, and turning my Christmas card into a nerd project. It’s all there. Get Automating! This week MacSparky is sponsored by Agenda Minder. Agenda Minder is a productivity tool that helps you prepare for meetings and developers meaningful agendas. Meetings are rarely fun but with Agenda Minder at least they can be efficient (and faster!). With Agenda Minder you can add meeting details, import existing calendars and, most importantly, add agenda items. Then you can share that meeting information with your team via HTML, text, and, with the next update, OPML. Be that guy who sends out an agenda in advance. You’ll be shocked at how much the meeting's attendees appreciate your preparation. There are more features, like filters and tags but in my opinion, this app really proves itself with meeting planning. With the upcoming 1.7 update Agenda Minder will add dark mode, export to OPML, and several nice design tweaks. Show everyone on your team how it is done with Agenda Minder. Learn more over at the Agenda Minder website and use the links in this post to get the app for just $8.99 through the end of December. I have been using the Fujitsu ScanSnap scanners for a long time now. Today Fujitsu announced that they have a brand new 64-bit version of their scanner software. This comes as a relief to users that have been getting the 32-bit software warning. I've been using the 64-bit software for a while and had no issues. Interestingly, this is not an upgrade to the existing software but a brand new version of software that you’ll need to download from this link. Subscriptions! It seems the wave of the future, but should we be happy about that? In this week’s episode of Mac Power Users, Katie and I talk about this trend towards subscriptions and the software and services we believe are worth the effort. eero: Never think about WiFi again. Get $100 off the eero base unit and 2 Beacons package, and a year of eero Plus. The holidays are here and I’ve been doing more work on my “Yule” playlist. I’ve made lots of new additions this year including this gem from Joey Alexander. If you’ve got an Apple Music subscription, go ahead and subscribe and enjoy. The playlist is very heavily jazz but with a few other delightful holiday songs from other artists, including this one where Jack Johnston takes Santa to task for the way they were treating Rudolph just because he has a red nose. As we are now on the back end of Thanksgiving with the holidays upon us, a lot of us are thinking about new automation routines using Siri Shortcuts. One shortcoming with the new system is the inability to address a specific HomePod via Siri Shortcut. You can play music through a specific HomePod by triggering the shortcut with your voice. MacRumors did a nice explaation of that today. I’m thinking, however, in terms of a remote trigger that doesn’t involve me talking to the specific HomePod. What if I just want to trigger a shortcut that has a music playlist in it and address a specific HomePod without using my voice? Or even better, I’ve got a HomeKit switch on my front door. Why can’t the act of opening my front door enable me to not only turn on the Christmas tree lights but also play my Yule playlist through the downstairs HomePod? For the time being, at least, you are going to have to trigger that playlist from the HomePod itself using your voice. While I’ll agree that Siri Shortcuts got a lot further in the last six months than I ever expected it, this is definitely one of those tools where the more I get, the more I want.